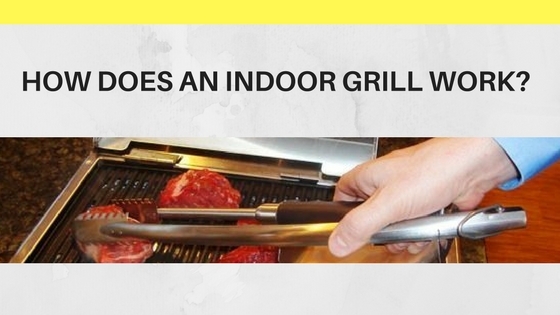 What Is an Indoor Grill? How Does It Work? Grilled food is famous all over the world for its exceptional taste and unique look. We all know that to grill foods we need an open space. How many of us have a clear idea about indoor grilling? Is it possible to grill indoor? Is the taste of the food like outdoor grills? 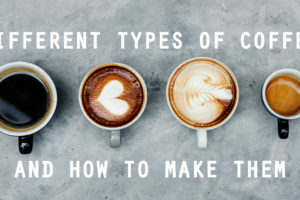 Is it healthy? how can i solve my indoor parts problem? Many questions arise. 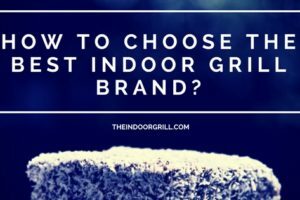 If you don’t have a clear idea of what is indoor grill is and how it works, this article is just for you. We are here to give you the basic knowledge about indoor grilling and indoor grill parts. So, let’s explore what indoor grilling is and if it is beneficial for you. You can’t use outdoor grills inside as that creates smoke and carbon dioxide that might kill you. So, the indoor grill is the cooking equipment which produces no smoke and still gives you smoky flavor fits in your kitchen. Indoor grills give you the same taste but not the hazards. Different type of indoor grills parts get from market. Some of the grills are made to fulfill multipurpose. But there are some parts which are essential for every grill. Base: The base carries the full rack. It is the platform for all other regions. The base is a flat surface at the bottom of the grill. Drip tray: We need the drip tray to drain away the grease and other things that we don’t want to stick with the food but necessary to cook. Upper Grille & Lower Grille: This two grille mainly contains foods. In some grills, upper grille is absent, but the lower grille is a must. Lower grille stays above the drip tray, and the upper grille is below the lid. Lid: The lid covers the food, keeps the temperature inside and helps the food to cook in time. The lid can be of glass or stainless steel depending on the model. Hot plate (top and lower): Hot plates absorb heat first and then pass the heat to the food. As we don’t use charcoal or gas in an electric grill, hot plates play the role of them. Temperature control: Temperature control should be kind of a good indoor grill. 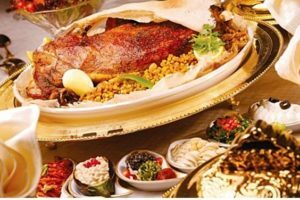 If the temperature control doesn’t work well, no matter how much concern you were, your food won’t be able to reach your expectation. So, check and double check the temperature control. Lock: Lock helps you to maintain the pressure and prevent grease from tipping over. So, the lock needs to be strong enough. So, Lock is the most important part for indoor grill parts. 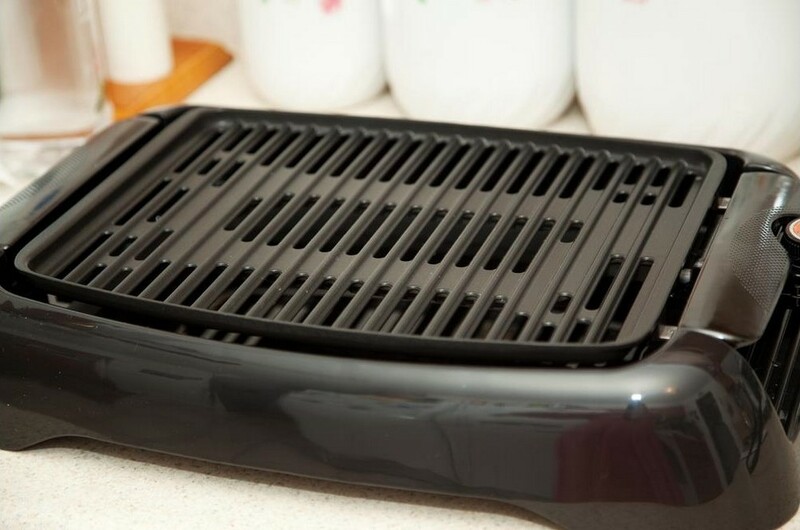 Indoor grilling must be done on a grill or grill pan designed for indoor grilling. You'll find the different size of racks in a market. You have to find out a perfect one according to your need. There are two types of grills in a market. The open grill: The open grill is similar in cooking style to an outdoor grill. These electric appliances has a heating element and a grill like cooking surface. While you have to flip foods to cook the experience of grilling evenly is much more authentic, and the flavor is closer to the real thing. The folding contact grill: The advantage of a contact grill is that they cook on both sides simultaneously and require less attention from the cook. Grill Pans: Relatively inexpensive and readily available, the grill pan is a great option for indoor grilling. The trick is to find one that has a lot of mass to it so that it can sear better and has high ridges. Many grill pans are lightweight and have ridges that fail to lift food away from collecting grease. How Does an Indoor Grill Work? You might be doubtful about how an indoor grill works. Here are the steps of an indoor grilling pan work procedure of cooking. When grilling indoors, a single container takes the place of the entire gas or charcoal grill, so the thing better to be sturdy. If using a cast iron grill pan, season it according to the manufacturer’s instructions, then lightly rub with canola oil before each use. If using a non-stick or another type of grill pan, a light coating of oil is all you need. To ensure a successful indoor grill session, Pat food dry if it’s damp, lightly brush it with olive oil, and season both sides with salt and pepper before tossing it over heat. If you’re grilling with a marinade, brush loose pieces of herbs, garlic, etc. with oil, so they don’t burn. 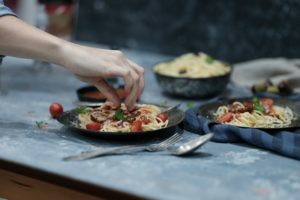 Place the grill pan on the stove top and heat it until it is boiling, then reduce the heat to medium-low and maintain that temperature throughout the cooking process. If the pan starts to smoke, it’s getting too hot, and the heat should be turned down. Set food on the grill and walk away. Just leave it undisturbed for 3 to 4 minutes, then rotate the food 90˚ without flipping. It will create a crosshatch pattern, and make you look like a pro. Cook for another 3 to 4 minutes and repeat on the other side. The nature of grilling is to create that charred, smoky flavor; unfortunately, that character is not possible without creating a little smoke. Open your kitchen windows and turn on fans before you activate the flame. If your house or apartment is not well ventilated, grill inside the oven to help carry some of the smoke plus speed up cooking time. Grilled meat should feel firm or register 160˚F on a thermometer. After the flesh comes off the grill and sits for a few minutes, the temperature will rise to 165˚ or higher. It is called carry-over cooking. So, that's it. When you want to taste grilled food, but don't have any open space to arrange outdoor grilling or having too much rain or cold outside, an indoor grill can be the best alternative. You don't need to wait for summer or an open space anymore. You can have your favorite grilled items anytime and anywhere. Though most of the time indoor grill can't give you the taste exactly as the informal one, it's close enough. You can have tasted like outdoor grill if you maintain some cooking tricks. So, what are you waiting for? Go, have some experience of indoor grill parts . Amaze others with your skills. Are Griddler Plates Dishwasher Safe? Why Do You Need an Indoor Grill?